This exterior shot of Gemini South shows the result of the Gemini Multi-conjugate adaptive optics System (GeMS) with the Gemini South Adaptive Optics Imager (GSAOI) propagating a laser guide star toward the zenith. Gemini South acquired the 50-watt sodium Guide Star Laser System back in March 2010. It moved into regular operations soon thereafter. 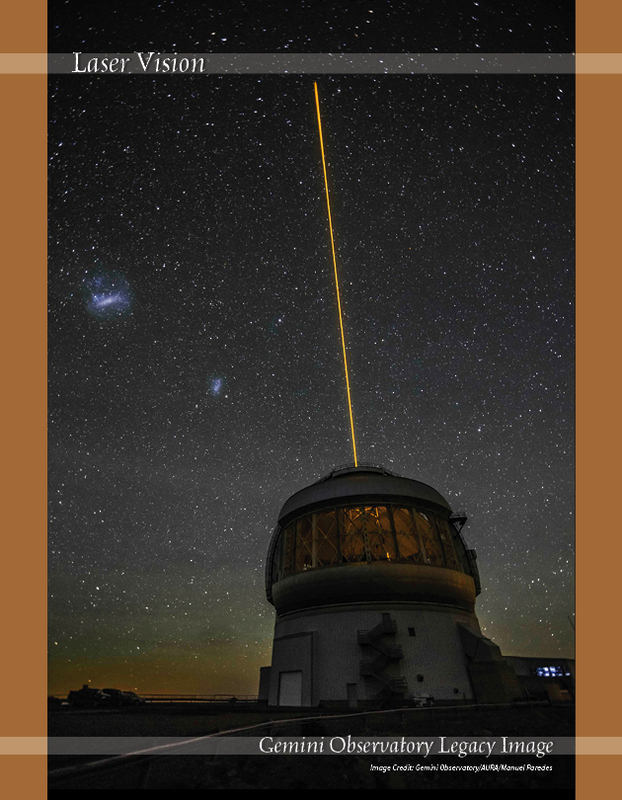 The GeMS/GSAOI system is a revolutionary approach to adaptive optics in astronomy. The technique samples the turbulence structure in the atmosphere at several levels and then uses a technique similar to medical tomography to reconstruct a 3D snapshot of how the atmosphere is distorting starlight. This is then used to shape a series of deformable mirrors to cancel out this distortion. All of this happens about 1,000 times a second. In the sky, to the upper left of the dome, floating like detached fragments of the Milky Way, lie the Large and Small Magellanic Clouds. These nebulous wonders are actually irregular dwarf galaxy companions to the Milky Way some 200,000 light years distant. Gemini dedicates this image to the memory of Vincent Fesquet, who worked tirelessly to make the Gemini South laser guide star system work efficiently and reliably.